‘Tis the season for the resolution. As I’m still (happily) working my way through my resolutions of last year, I don’t think it’s prudent to make any more – except for my perennial resolve to consume less and make more. 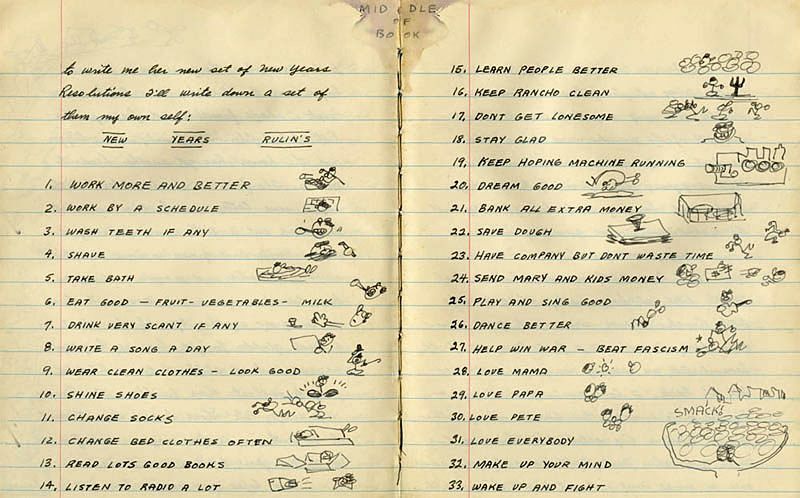 So I share with you Woody Guthrie’s “New Years Rulin’s” of 1942 – the viral hit of 2012. Can’t resist the list. My favorite is number 18: Stay Glad. Happy New Year! This entry was posted on January 1, 2012, 10:07 pm and is filed under inspiration. You can follow any responses to this entry through RSS 2.0. You can leave a response, or trackback from your own site. What a find…my favorite.#3.wash teeth, if any, holds particular appeal. No way I could do #7 though. Plenty are worth striving for. Will check back next year to see how we did. How cool is that! Makes you wonder what he was doing before though… ewww!